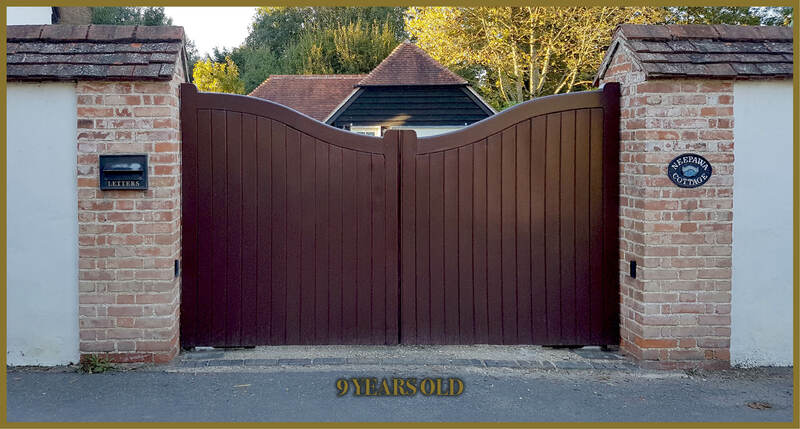 Maybe there is no definitive answer to this question, and timber gates are not normally sold with a guarantee because there are so many factors that influence the life of external gates. Two identical gates fitted in different circumstances, can and have vastly different life expectations. 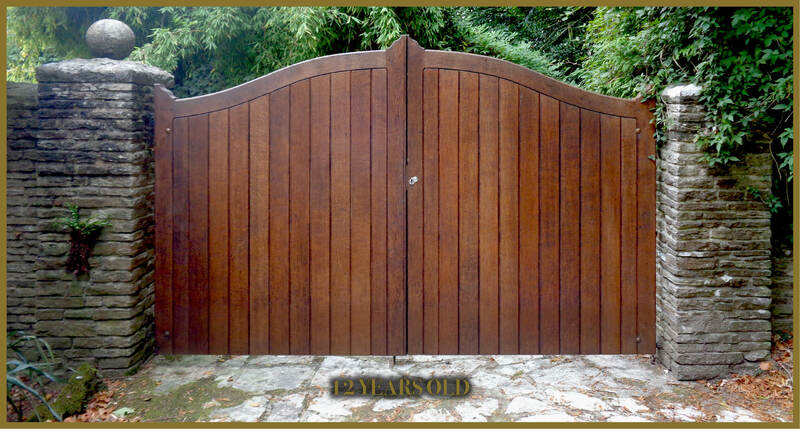 The type of timber must be considered when designing and choosing a gate for long life use. Softwoods are non-durable and decay very quickly. Durable hardwoods like Iroko and Oak are the preferred choices. Often the main influence is the weather, and the more sheltered the gates are, the longer they will last. Direct sunlight also has a big part in the weathering process, and to position the gates in a shaded area, has an advantage to maximising a gates life. That said – timber gates under trees will speed up the decaying process, and so close proximity trees for shelter is not considered favourable. 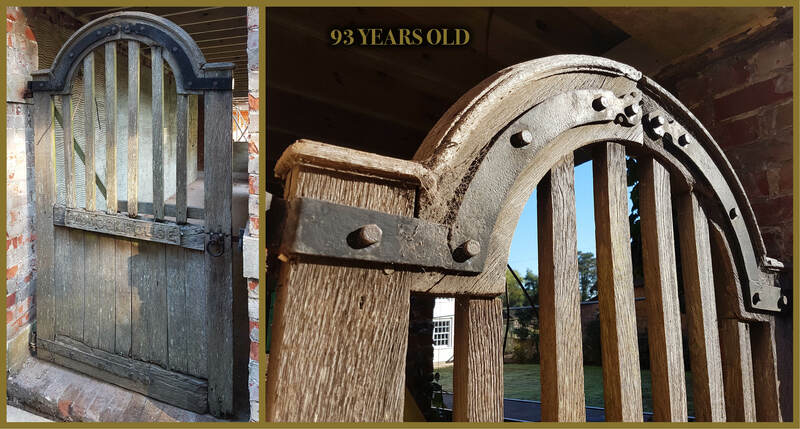 Below we have some examples of how long timber gates have lasted, starting with some fascinating cases of up to nearly a 1000 years old! The Westminster Abbey picture above, shows a door that has been dated as almost 1,000 years old, making it the oldest in Britain. The door is 6ft 6in by 4ft in size. Experts used tree-ring dating to establish that it was manufactured during the 1050s, making it the only known surviving Anglo Saxon door in the country. Study’s from the Oxford Dendrochronology Laboratory removed a 0.2in core of wood from the side of the door, and by examining the spacing between tree rings and comparing the pattern with other pieces of wood from known dates, they were able to identify the tree from which it was made as having been felled between AD 1032 and AD 1064. Work on the original abbey began in the late 1040s during the reign of Edward the Confessor. It was dedicated in 1065, in time for the coronation of William the Conqueror in 1066. From what is known about the order in which the original structure was built and the architectural detail of the nearby cloisters, archaeologists dated the door to the 1050s. Chepstow Castle. 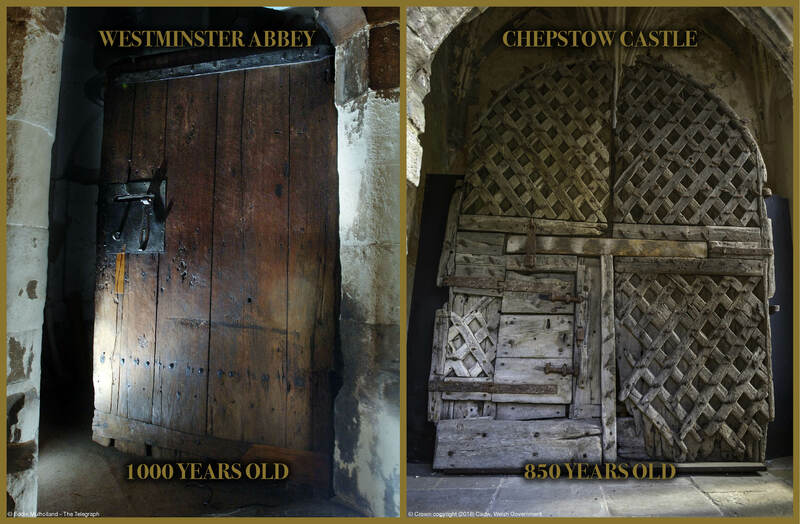 The main outer gatehouse doors at Chepstow (pictured above) have recently been dendro-dated to give a felling date of the timber used of between 1159 – 1189. This remarkable survival puts these original gates amongst the oldest surviving castle gates in Europe. The carpentry techniques used to make the doors are also early and push back the provenance of the sophisticated carpentry methods to be amongst the earliest examples of these techniques known in northern Europe. Chepstow doors show the earliest use of lattice bracing in their construction. Measuring 8ft 5in (2.5m) wide by 11ft 7in (3.5m) tall, for close on a millennium the gates saw off all-comers, from marauding Welsh princes to Oliver Cromwell’s New Model Army. Microscopic holes drilled into 14 different timbers also showed that they were constructed from a mixture of seasoned and green oak, allowing them to flex and bend both when under attack and through climatic variations. The oak planks used are one of the earliest examples of oak being sawn rather than the traditional method of cleaving wood with axes and wedges. So can I expect my gate to last 1000 years? Probably not! Both these examples above are in more protected environments than most gates, but there is plenty of evidence of gates that are typically exposed to the weather and have lasted an amazing number of years, as the examples below. The pedestrian gate pictured above, made from oak, is amazingly over 90 years old. And still holding together enough to be used regularly. I think we can say that it now coming to the end of its life and although it is looking a bit antiquated, it has its own old admirable character. 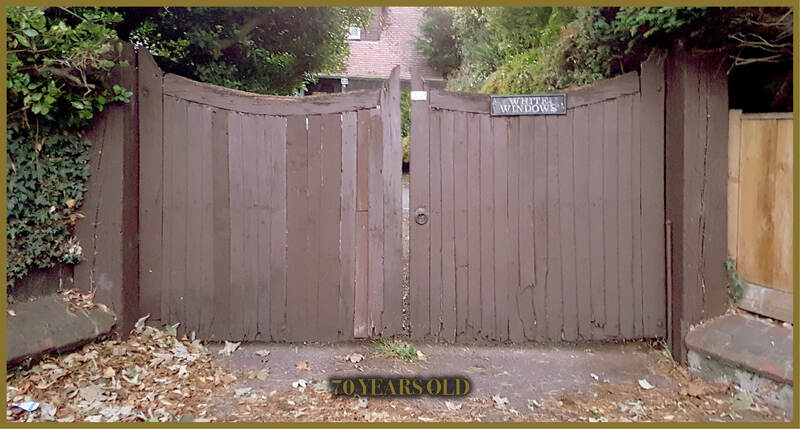 These gates and posts pictured above are 70 years old and manufactured by the great grandfather of the Penchard founders. (constructing quality gates must run in the family!) Even now in 2018, they are closed each night, giving 70 years of use! 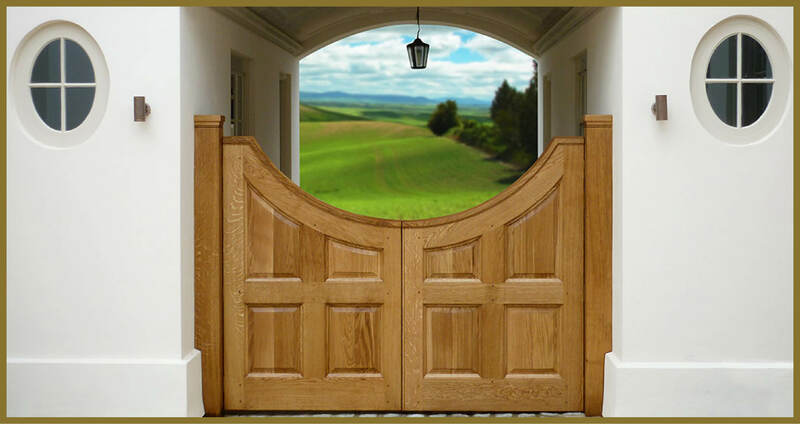 They are made from English oak with a traditional mortice and tenoned jointed frame. You’re probably thinking – well they don’t look great! That is fair enough, as they have faced 65 years’ worth of English weather conditions. All things considered, maybe they don’t look so bad? But how long can I keep my gates looking nice and fresh? It all comes down to how much time you put into maintaining them. A yearly re-sand and coat of wood protection can result in ongoing great results for many years. 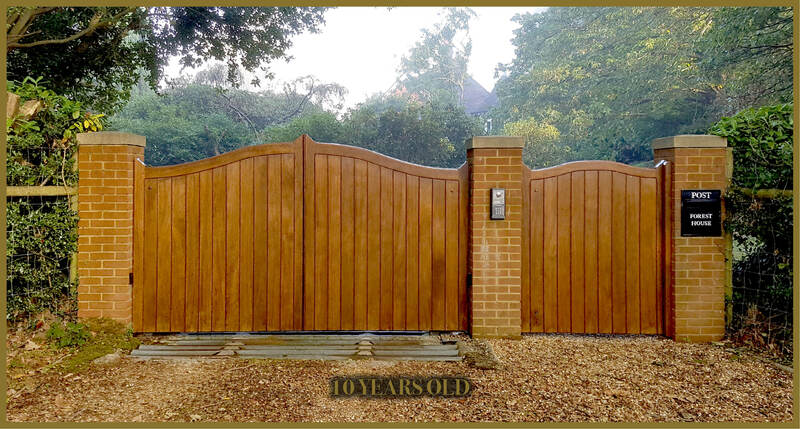 Below are some examples of gates that have been well looked after. What if I don’t give them regular maintenance? If a natural weathered look is your preferred choice, then just leaving them without any timber protection can still give many years of good use. Conclusion Choose the right material and Invest in quality well made gates and you will see many more years of use from your gates than what most people think. Decide how you want them to look and choose how much maintenance will be required. Seek professional advice if you are still need guidance.